Rev. Ayuba Usman, the Deputy Chaplain of the 7 Division of the Nigerian Army, predicted on Sunday that the end of the Boko Haram insurgency was near. He said that the military would soon record resounding victory over the insurgents. Usman, a Major in the army, made the predication while delivering a sermon at an inter-denominational service to mark the 2017 Nigerian Army Day Celebration (NADEL) in Maiduguri. “This is the year of victory as the end of the enemy has come. Our time of victory has come,” he said. Usman urged officers and men of the Nigerian Army to surrender their lives to God for the victory to manifest. “The officers and men of the Nigerian Army must return to God for the victory to take place. “They must return to God just like Joshua did in the Bible,” he added. Quoting from the Bible, Usman that Joshua conquered Jericho without firing a single shot; but by the power of God. “The walls of Jericho collapsed and gave victory to Joshua by the power of God. “The walls of Boko Haram will soon collapse if the Nigerian Army surrenders itself to the will of God,” he said. During the service prayers were offered for the peace and progress of the nation. Prayers were also offered for fallen soldiers who died in the service of the nation. In his goodwill message, Brig.-Gen. Ibrahim Yusuf, the General Officer Commanding (GOC) 7 Division of the Nigerian Army, also expressed optimism that the military would soon uproot the remnants of the insurgents in the North- East for peace to reign. Yusuf was represented by Brig.-Gen. John Ochai the Chief of Staff 7 Division. On Friday, a special Jumat service was held to mark the Nigerian Army Day Celebration. During the service, Major Muhammad Idris, the Chief Imam of Maimalari Cantonment Central Mosque, offered prayer for the quick recovery of President Muhammadu Buhari. He also offered prayers for the well-being and victory for the Nigerian Army especially those fighting insurgency in the northern region of the country. Personalities that attended the prayers include the GOC 7 Division of the Nigerian Army, Brig.-Gen. Ibrahim Yusuf, commanders, principal staff officers, senior officers of the Theatre Command Operation Lafiya Dole, 7 Division Nigerian Army as well as civilians. NADCEL is annual celebration of the Nigerian Army to commemorate the beginning of the civil war. It is marked with events that climaxes on 6 July of every year. 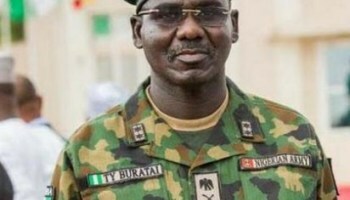 The Chief of Army Staff, Lt.-Gen. Tukur Buratai, on Tuesday addressed top US defence officials and policy leaders on the efforts made by the military in the fight against insurgency in the North-East. More Boko Haram Terrorists fleeing the air and land bombardment of the Nigerian Airforce and troops of the Nigerian Army have met their waterloo as scores escaping from Sambisa forest were felled by the military.